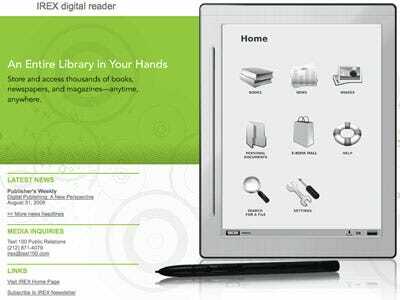 Mossberg Disses The iRex: "Much Clumsier To Use Than The Kindle"
The iRex e-reader is latest Kindle challenger to hit the market. And according to Walt Mossberg, it’s the latest to fail at producing a better experience. While the Kindle might be on the cusp of being made (basically) obsolete by the iPad, it still doesn’t have a major e-reader challenger. …in my tests, I found the Irex much clumsier to use than the Kindle and, because of that, I still prefer the Amazon device. For instance, the Irex requires a stylus—an ancient and fading navigation device—for some operations. Yet it lacks a holder for this pointer except in the leather cover, so the stylus is easy to lose. The Irex also lacks a Home button, a note-taking function, any way to highlight text and a built-in dictionary. More important, I found the mall concept for downloading books to be frustrating. Because the Irex isn’t seamlessly linked to its own online store, I had to establish, or sign into, four different accounts to test the device fully. Even after that, each Barnes & Noble download required multiple steps. On the Kindle, ordering books is a breeze, and they appear almost instantly after you click a single “Buy” button.